I have a very small examination room in my practice and need medical exam tables that are space saving. What options should I consider? Many examination rooms are small and designed to hold only the basic in equipment and supplies. 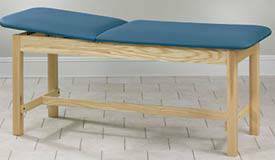 Since medical exam tables may be the largest item in the room finding space saving options is essential. There are several different options to consider that can be ideal as general use tables even in limited space. One option is an adjustable length table. These are typically designed to have the head and footrest fold down, leaving just the middle section flat as the top of the table. This provides a wide range of position and options for using the table during examinations and treatments. They may or may not have the option to position the backrest to an inclined position rather than the flat position. Many of these styles of tables are open and designed with an H-brace structure for support and safety. Other options may include a cabinet under the center section of the table that can add to storage space in the room. These cabinets have adjustable shelves for individual configuration. In addition these cabinets can be locked to prevent access to the contents by unauthorized individuals. A chair style option is also space saving. These models are often hi-lo options, providing easy access to the chair by the patient. Once seated the entire chair is lifted and then the back reclined into the desired examination position. Leg rests and stirrups are recessed into the base of the chair and can be extended as needed. Are there any eco-friendly medical exam tables on the market and what makes them "greener" than standard tables? More and more facilities are moving towards LEED certification and becoming more environmentally friendly. 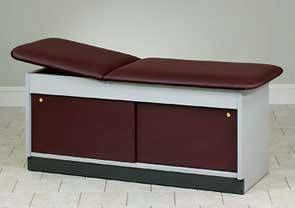 There are medical exam tables that provide eco-friendly styles and features. Wood construction is a key element which provides a warm look to the room and, with different colors of coverings, can coordinate with any décor. However the hardwood legs and frame also means that the table can be recycled and does not contain any plastics or PVCs. Natural stain and wood colors also means that there is no paint used in the manufacturing of the frame. If the frame is painted or laminated the materials used are lead free and all upholstery is fully PVC-free. Eco-friendly medical exam tables can have a full cabinet as well. They can include 100% recyclable metal components for all hardware used in the construction of medical exam tables. In addition all wood on the table, including the laminated panels can be manufactured with no added urea-formaldehyde. These options are typically very cost effective and highly comparable to traditional styles of tables on the market. What is the difference between medical exam chairs and examination tables and which is best? 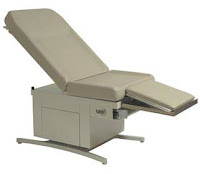 The term examination chair is often used to describe hi-lo medical examination tables that can be placed in the upright or chair position for patient examinations. These tables are very practical in all types of settings since they are compact yet offer more positioning options than a standard table. There are different models that are designed for bariatric patients, patients transferring in and out of wheelchairs and patients with mobility problems. Since the table top or seat can be lowered and raised to the right level, patient comfort and safety is maximized. Other option in chairs can include specialized equipment. Podiatry chairs with additional support for legs and feet combined with power backrest and tilt allow the patient to be placed in the correct position for any procedure. This allows the patient to remain in the seated and reclined position while the foot is at a level that is comfortable for the medical staff. Longer procedures are made much easier on all involved when this position option is possible.